I love the holiday season but I'm not so in love with the concurrent cold & flu season that hangs around like an ill-tempered cranky phlegmy unwanted guest. We all know how important it is to keep our hands clean in order to slow down the spread of germs but it's not always convenient to wash our hands with soap and water - which is where hand sanitizer comes into its own. I like the convenience but am not a huge fan of the other aspects of hand sanitizer. Of course, I don't know about you, but regular hand sanitizer dries my hands out - probably due to the alcohol. And speaking of alcohol, did you realize that standard hand sanitizers are at least 60% alcohol? They have to have that high of a percentage in order to kill bacteria. There have been cases of kids getting alcohol poisoning from hand sanitizers. I can totally see how that happens: a kid gets sticky hands and Mom puts some yummy strongly scented sanitizer on their hands to clean them up and kiddie thinks that it smells good enough to eat, or at least, lick. What's even more worrying are the teenagers who are drinking the sanitizer intentionally. If that wasn't enough to make you somewhat concerned about regular hand sanitizers, there are always other ingredients like Triclosan which is under scrutiny by the FDA currently. Triclosan has shown that it disrupts the endocrine systems of animals - basically, it messes up their hormones. It is also thought that Triclosan aids in making bacteria more resistant to antibiotics. So just to get things straight, the stuff I'm putting on my hands to kill bacteria could be actually making bacteria stronger? Ummmm...I'm no scientist, but that's kinda what it sounds like to me. Is there a better solution? Why yes there is, thanks for asking. CleanSmart is a naturally moisturizing sanitizer that kills 99% of germs WITHOUT using alcohol OR Triclosan. The key ingredient is Hydrochlorous Acid, a naturally occurring chemical that the body's immune system produces. It is hypoallergenic and fragrance free so littlies will be tempted to lick it. 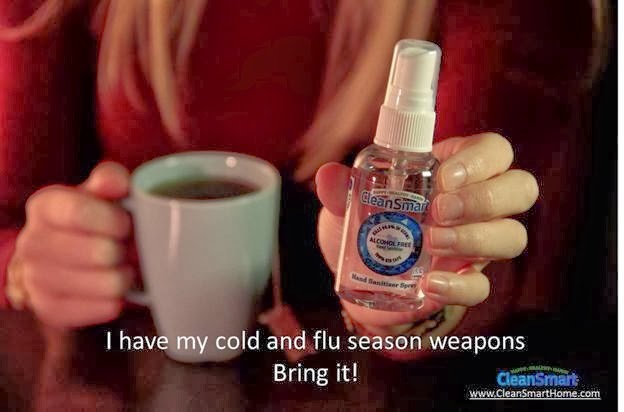 And the nasties that CleanSmart kills makes for an impressive list including strep, staph, rhinovirus (the common cold) MRSA, H1N1, and even athlete's foot. Right now, CleanSmart is only available online but will be rolling out to brick and mortar stores after the first of the year. Lucky for us the good folks at CleanSmart have sent me some hand sanitizers to give away to a couple of my readers. Please enter via the Rafflecopter below and winners will be chosen 12/24/13. The winners will have three days to contact me after being notified before a new name is chosen. The winners have all been contacted. I use hand sanitizer every day at work, glad to see that this is alcohol and Triclosan free! I do use it often... I am definitely interested in an all Natural one!! I will have to check it out! I work with the public and they always come to work out when they are sick. This could be handy! I do use hand sanitizer regularly - especially while out in public like at the park, grocery store, etc. I use sanitizer every time I get into the car from shopping. I use hand sanitizer on the go. It'd be great to have an alcohol free version! Oh my gosh yes!! I keep a small bottle of it in my purse and use it after pumping gas, handling money, etc. I can't live without the stuff! I use hand sanitizer all the time! Yes...we use it almost everytime we go out. I do use it especially during flu season. yes, I do several times a day! I keep it in the car for my boys. I used to use it all of the time, but now only for emergencies. Yes, I use hand sanitizer! Do you use hand sanitizer on a regular basis? Yes all of the time! We use it all the time especially when we are on the run!